At some point you’ve probably asked the question, What does God want me to do? You may have thought about it in relation to your life in general or because of some problem or big decision you were facing. Either way, it seems like a difficult question to answer. How can we figure out what the God of the universe wants for us? One of the things I love about the Bible is its clarity. Sure it has some cryptic passages and certain issues require a lot of study. But not when it comes to figuring out this question. God’s answers are clear, concise and to the point. The answer to the question What does God want me to do, initially depends on where you are at in your life. If you don’t have a relationship with Him there is a first step He wants for you. After that, there are two other steps He’d have you take. I’ll take them one at a time. What Does God Want Me to Do First? More than anything, God wants to have a relationship with you. He loves you more than anything and wants you to experience that love. In order to have that love, you must first believe that His Son, Jesus Christ, died to redeem you from your sin. Jesus came to save you. But why did he need to do that? What is it about my life that needs saving? Put simply, God is perfect and we are not. Romans 3:23 says, “…for all have sinned and fall short of the glory of God. That sin causes a spiritual separation that needs to be fixed if I am ever going to have a right standing before God. Romans 6:23 says, “…For the wages [penalty] of [our] sin is death, but the gift of God is eternal life in Christ Jesus our Lord.” Jesus’ death on the cross and our belief in Him became the way we could bridge the gap between ourselves and God. By believing and accepting Jesus as our Savior we enjoy the reward of eternity in heaven with God. God wants to have a relationship with you. That’s the first thing he wants you to do with your life. He will be patient. As II Peter 3:9 tells us he doesn’t want any to perish without knowing Him. He wants all to come to repentance and acceptance of who He is. I hope you have already believed and have given your life to God. If you have, then there is a second thing He wants you to do with your life. 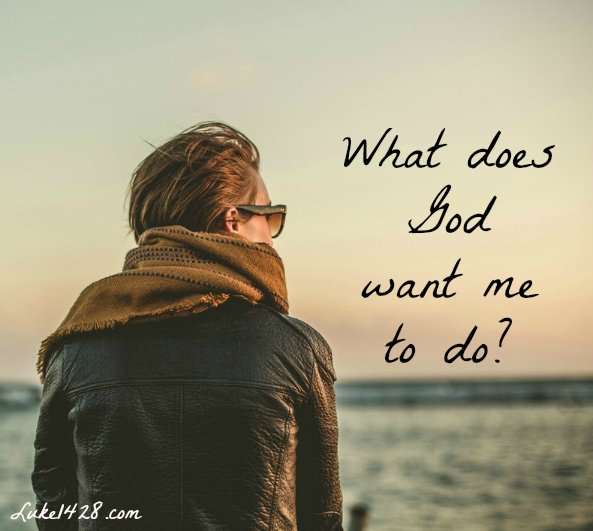 What Does God Want Me to Do Second? Now the question was simple but tricky. There were hundreds of laws laid out in the Bible for the Jews to follow. How could Jesus narrow it down to one great commandment that was better than all the rest? Love our neighbor (all people) as we love ourselves. If we do those two things, we are living out the essence of what God wants for us. By loving God with all our being, we will choose to follow Him only and be obedient to His words in the Bible. By loving others, we have the chance to be used by God to bring other people to the knowledge of Him. Not that these two things are easy mind you. We have issues [i.e. sin, habits, other desires] that get in the way of and disrupt our love for God. And we have things that get in the way of and hinder us from loving those around us. However, those two things are clearly His desire for us. Jesus said all the laws and prophecies of the Bible have their origin in those two commands. If we try our best to fulfill both of them, we will be right on track to doing what God wants. But what about all the difficult circumstances in life where we don’t know what to do? God has an answer for that to although it’s not going to be the same for all of us. What Does God Want Me to Do Third? The third instance where we might ask the What does God want me to do? question is when we are facing a difficult decision in our life. Maybe you are looking at where to go to college or who to marry or what career decision to make. Perhaps you have a challenging situation with a family member or friend and you don’t know what path to take. Or maybe you are struggling with some other personal issue and feel directionless and that there is no way out. The challenge with difficult life decisions is that no one other person can tell you exactly what to do. You can seek counsel from others but the decision has to come from you. Fortunately, for those that have a relationship with God, He’s provided us a path to get there. When you don’t know what God wants you to do with your life, the first step to figuring it out HAS to be praying for wisdom. And, according to the verse, what’s the clear promise when we do pray for it? Wisdom – given liberally by God – to make the right decision. God will guide us into the right answer when we ask. He won’t disappoint. The understanding of the answer may take some time but God will direct our thoughts if we let Him. When we pray and ask for help in making a decision, God will grant us wisdom. And He will also give us something that can’t be explained – His peace. It’s a peace we can’t understand. We can’t comprehend it. But we can feel it. We can know it. We can experience it. And it’s in those moments of peace, after much prayer and contemplation, that the answer to your difficult life circumstance comes. What does God want me to do with my life? Clearly he wants me to know Him. After that happens, I’ll serve Him with all I’ve got and love others. And when those challenging moments come, turn to Him in prayer for the answers. Especially pray for wisdom and be patient for the answer. His promise is that He’ll guide us each step of the way. Questions: Have you given your life over to God? If not, what’s holding you back? Are you dealing with a difficult circumstance right now? Have you ever felt God wasn’t really helping you reach a decision? What can we do more of to show love to those around us? “love God”, you say… “love your fellow man”, you say..
2) because of 1), I’ve become quite anhedonia, meaning I feel no joy. I feel nothing but frustration and sadness. 3) Because of my loveless upbringing in a dysfunctional family, I do not know what it is to truly love somebody or something, not do I know what it feels like when somebody loves me. I feel nothing, nada, a complete blank. I have prayed to the Lord, citing Matthew 12 : 28-30. From this, He has lifted some of the burden of my major depression, which I am very greatful for. I have a sense of inner peace about me, when if you look at my circumstances, I shouldn’t be in, still, I’m not sure of my future, so have to keep reminding myself of Proverbs 3 : 5-6. I also thank Him for that. I’m still trying to find my ‘place’ in this world, my siblings had theirs all figured out and followed them from their mid teens. It is not an ideal place to show love from, I’d that were possible. If Jesus were to knock on my door today and ask me what I’d like to do, I’d tell him I’d love Hun to work through me to heal sick and injured animals, like he did with his disciples, with Him getting all the glory, and my staying humble before Him (days the person typing all this while he’s in tears of being lost, lonely, and not knowing what to do (except ask the Lord).. Ive been in some very dark places, but those have go en me a brief glimpse of what I believe Heaven to be like – there was an afternoon when I was 30 where I fell asleep, for a while, then became aware of my body having no weight , my worries gone, having no earthly weights upon me, and seeing I was in an area that I can only describe as white all around me. The feeling of peace and calm flowed over and through me. That only lasted about. 30 seconds, after which I became aware of this world again , feeling my weight return to my body, along with all ly life’s never ending tribulations slowly, one after another. Oh how I’d love to go back to that place of peace. Lee me end by saying prayers do work, not all of mine have been granted, but the Bible points out the caveat of them being granted if they coincide with what God plans for you, oh and don’t forget how Jesus advised to pray like your prayer has already been granted, meaning thank Him for what youre asking for even though you may not have it, as opposed to asking Him to do something you. I typed “God, what should I do with my life” into google, and this was the first page that came up. I know what I “should” do in the little things in my walk with Jesus, and I know he gave me gifts and a calling on my life… but sometimes I still feel so lost, depressed, and frustrated. Angry at my job, my house, my life. Then I feel guilty because I accepted Jesus Christ as my savior 30 years ago! Why am I still struggling with the same issues that I’ve had my whole life? I should be walking in wisdom and in a closer relationship with Him, not walking around this same mountain (again!). I know that the Holy Spirit is our comforter, without Him I would be beyond hope. And after reading so many posts on here, I know I’m not alone. I know that I can reach out to a Savior who not only saved me once, but continues to keep me so, as one of His sheep. The bottom line is, He wants to be there for me, He wants me to cry out to Him, He wants that deep relationship with me. And through that relationship, I believe is where He will speak and guide me in His loving plan. Thanks for letting me talk that out, don’t give up! Thanks for sharing Eirenne! God’s arms will always be open to those who seek Him, even if we struggle with the same issues over and over again. I think it would be nice to include Micah 6:8, “He has told you, O man, what is good; and what does the LORD require of you but to do justice, and to love kindness, and to walk humbly with your God?” My challenge is to find how I can best do that. I feel like I am frittering away my life and I don’t want to feel regret on my death bed that I could have done so much more. Where do I find these opportunities? you must forgive yourself or u will never more on with the lord , we all have done evil things ,our sins is common to all mankind you are not alone i forgave myself and feel much better now i have moved on with the lord and he is guiding me he wil do the same for you just open up to him and ask for his help. I think forgiving yourself starts with humility. Recognising that God made us, and He made us “good” (Genesis). His intention is for all people to be with Him forever, and He is fighting, as well as the enemy. If we keep on fighting for God, of course He will win. He can overcome the evil in the world and will call us to Himself. We just have to lay the foundation in our own lives. Also, it isn’t a switch. I believe faith is something that can grow and needs to be nurtured. Jesus often said “you of little/great faith”. He is too in charge of our lives. You will fall, and get back up (Peter – I think!). Just know God loves you so very much. You may find it easy to forgive someone when they ask, because they are valuable to you. In a similar way, but much greater, God will forgive us the second we ask for His forgiveness and accept Jesus payment for our sins! Bask in God’s love. Listen to Him in the breeze, the trees, and other people. He is there and will build you up. You will get stronger and stronger, and the Bible says that the devil will flee from you. I’m 22 and wonder if the devil will ever flee from me, because I am tormented, but I have faith great enough to know that even if at the end of my life, I will wait for the relief of being completely safe in God’s love, and no longer attached to the pains of Earth. Also don’t reject your physical, and other people’s physical needs. These are second to our soul! Look after the poor, love your neighbour. I struggle too. Hang in there. God bless you! I believe in jesus and god but I dont know how to be, I feel like I am going to hell no matter what I do I have done so much evil in my Past, I cant forgive myself so how can I expect someone else to forgive me. The Devil wants to enslave you and since you are free he will try to mentally enslave you by lying to you as telling you that you are too wrecked and wicked. It is a lie crafted by the father of lies for there is no censure or criticism from God. Him who the son sets free is free indeed! “He has told you, O man, what is good; and what does the LORD require of you but to do justice, and to love kindness, and to walk humbly with your God?” Micah 6:8. I used to not put my whole trust on God in some of the darkest situation of my life. But, my trust is fully on him because I know he has a good plan for me, even though I don’t feel it much as of the moment, and he is leading me to the right direction where by the end of this all I would have realized that God has made such a good, perfect plan for me, which I have to be thankful for. “…I know he has a good plan for me, even though I don’t feel it much as of the moment…” That is such a good point Kelly. Our knowledge of what God does for us helps us overcome those times when our feelings are a little out of control. Amen! I know God is leading me to the right direction and my trust is completely on him. Brian, if we just let God and know all his plans for us, we can go to that place or state he intends us to be in, in the first place.